‘Flying turtle’ from the archaeological site of Topoxte, a small island in the region of Peten close to the archaeological sites of Tikal Uaxactun. Topoxte itself is said to have been occupied during the pre classic and classic periods, 2500 BCE–250 CE and 250–900 CE respectively. Compared to the archeological sites nearby such as Tikal and Uaxactun, the buildings, temples, stelae etc at Topoxte are much the same but in smaller dimensions. Apparently the buildings and staircases and stelae at Tikal and Uaxactun are of megalithic style and proportions, stelas are up to three metres tall and individual stairs in a staircase are almost two feet high. According to legend this sculpture of a turtle is a depiction of the giant flying turtles in which the gods flew around, long ago. After visiting these archaeological sites Giorgio Tsoukalos has theorized that the much larger buildings and stelae etc at Tikal and Uaxactun were built by ‘the gods’ and occupied by them, as well as the priests, while the regular humans built the site of Topoxte in imitation of the gods’ handiwork but in dimensions livable to humans. Tsoukalos also theorizes that in observing the ways of life of ‘the gods’, that their technology was observed, language for which the humans were missing and that is where a flying vehicle of some kind was depicted as a flying turtle. 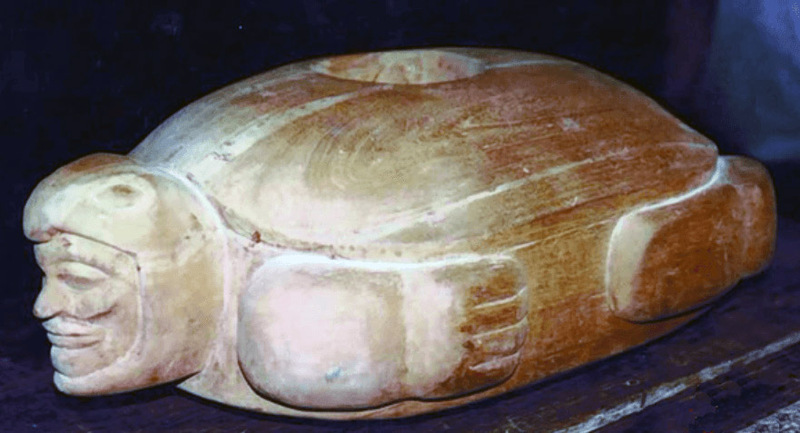 This theory is supported by the physical attributes of the clay turtle, with its appendages pressed tightly against its body creating an aerodynamic shape as well as the human head inside of the turtle head almost like it is a helmet and even what looks to be a depiction of goggles or eye protection of some kind on the human head. It is interesting to think, considering the myths and legends involving flying turtles here and in other places in the world, that a turtle with all its legs and its head pulled in leaving only its shell visible, would resemble the shape of a UFO. This entry was posted in Archaeology, History and tagged ancient aliens, flying turtles, flying turtles of Guatemala, mayan. Bookmark the permalink.